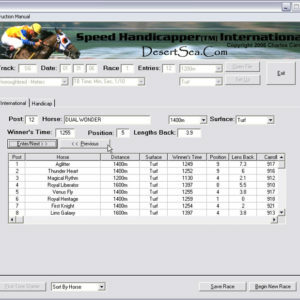 Handicapping Speed changed many basic ideas about horse racing, and it provides the background and theory for using Speed Handicapper® Software. 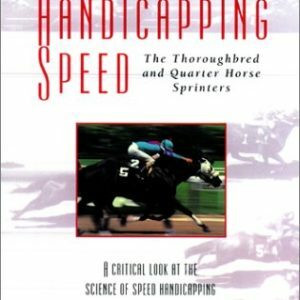 Handicapping Speed is a thoroughbred handicapping book, but it is the only book that covers Quarter Horse handicapping, both in its own right, and as a model for understanding the dynamics of Thoroughbred flying starts and early pace. Handicapping Speed is now available in multiple digital formats! The price for all digital versions is $9.95. The .pdf Version is available here for immediate download, to view and read in Adobe Reader® Searchable .pdf, 226 pages—Click Here for info—or, use the link above to jump to the phone and tablet version on Amazon. 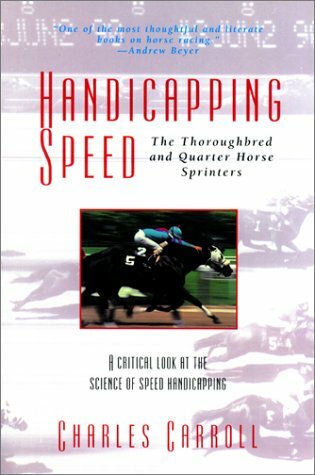 Now also available in digital, searchable .pfd format for just $9.95. .
“One of the most thoughtful and literate books on horse racing.” — Andrew Beyer, originator of the Beyer Speed Figures, Beyer On Speed, p. 55.